Five minutes to catch the Rapid KL’s City Shuttle service plying the Titiwangsa, Maluri, KLCC, Medan Pasar and KL Sentral hubs in Kuala Lumpur. The journey from these hubs to the 15 city shuttle routes took only a maximum of 30 minutes. The fare is RM2 for unlimited travel for the day on all Rapid KL buses. There are 138 buses plying 15 routes within the five hubs – KLCC, Titiwangsa, Maluri, KL Sentral and Central Market. All passengers are required to pay the fare on board the bus. 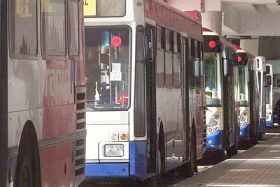 The driver will give the passenger a ticket, which needs to be retained for the rest of the day to enable one to hop onto another bus. No doubt this new bus service is good for tourists visiting Kuala Lumpur as it offers them a chance to explore the city and to take in the sights of the city center in the comfort of an airconditioned transport by merely paying RM2.00 for the usage of a daily pass. They can hop on and off at the destination of their choice and only have to wait 5 minutes before the next bus comes along. By utilising the modern intergration transport system from rail to road, now they can venture to all the places of interests within the city center at a very affordable rate and at their own convenient time. SELAMAT DATANG! We are a group of students aspiring to be a tourist guide one day. Our write up will serve those who wishes to know more about our country , Malaysia. From the places of interest , to the natural heritage , ethinic backgrounds , cultures, food , governments , history and economy. We trust you will find the articles provided will be of much use to you to get to know Malaysia as "Truly Asia".